Earlier this month, Punxsutawney Phil said there would be six more weeks until spring. It’s time to shake off winter hibernation in favor of winter fitness to get in shape for golf and all of your favorite spring activities. Getting in shape now will put you ahead in your game. It’s time to embrace winter fitness in preparation for spring!. Just because we’ve had a winter thaw that doesn’t mean winter is over! There’s still time for more snowstorms to blanket the landscape (and every Michigander knows that, unfortunately, Old Man Winter will make another appearance). There’s still time for you to get in shape for spring, but before you go play in the snow, you’re most likely to break out the shovel. Shoveling can be a great activity to prepare you for spring sports. It can also send you to the emergency room! Here’s how you can turn winter shoveling into winter fitness. Use an ergonomically designed shovel. You’ve seen those shovels with bent handles. Using this style of shovel will help you with proper technique when shoveling. Warm up before shoveling. No, we don’t mean throw on an extra scarf. We mean do some aerobics to warm up your muscles before going outside. Any time you exercise you begin with a warm-up. Shoveling is exercise! Keep your body in line with the shovel. Push the snow straight in front of you. Never twist your back! Use your knees and hips to lift the snow shovel. Don’t rely on your back alone! Shoveling snow is not a race. Take frequent breaks to stand tall and stretch. Do a few shoulder rolls. Lift only the weight of snow that you can comfortably control. Also keep one hand on the handle and the other near the blade when you lift. Aerobic exercise along with stretching and weightlifting make shoveling snow an excellent way to maintain winter fitness. And it’s exercise with a purpose! Don’t forget all the steps you take—shoveling can add to your 10,000 steps a day! Now that you’ve cleared the driveway, it’s time to get out and have some fun! Snowshoeing is a low-cost and relatively easy winter sport to take up, and it’s a surprisingly great way to up your winter fitness level. Don’t underestimate the benefits of snowshoeing! Just because it’s quick to learn doesn’t mean it can’t be challenging as well. You might think, “I’m only walking,” but you’re actually getting a whole-body workout! Make sure your cardio-vascular system is up for the challenge! Check with your doctor if you have any health issues related to your heart and lungs. Despite being out in the cold, you can work up a sweat with snowshoeing. Dress in moisture-wicking layers! Don’t forget to stretch! As with all exercise, do some stretching to alleviate muscle aches after a workout. Stretch all of your muscles. Your upper body gets as much of a workout as your legs. Snowshoeing lends itself to every age group, making it a great family activity. The aerobic workout you get will prepare you for any number of spring activities from golfing to biking to hiking. Downhill skiing can be exhilarating, but unless you live near the slopes, you can’t walk out your door and ski. Not so with cross-country skiing. Trails are usually near at-hand, making cross-country easily accessible for winter fitness enthusiasts. As with snowshoeing, cross-country skiing is a sport that lends itself to people of all abilities. Even so, paying attention to proper technique will prevent injury and make your experience more enjoyable. 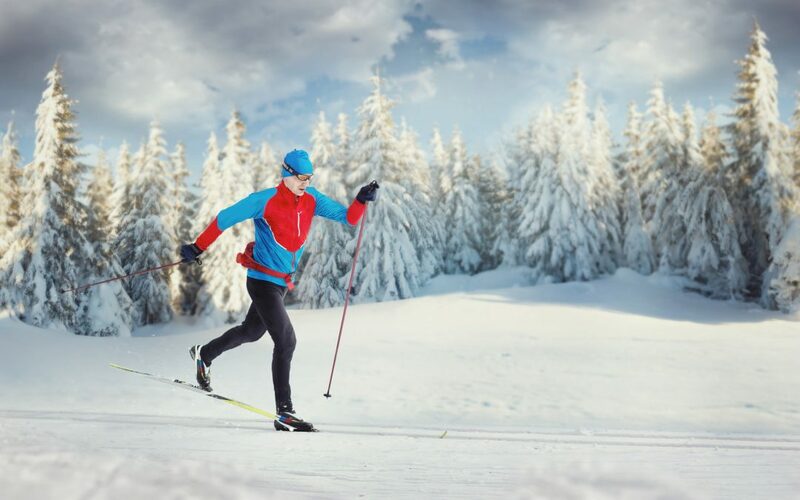 The diagonal stride is what most people envision when they think of cross-country skiing. This classic style is popular for many reasons—it’s easy enough for beginners to learn because it’s most like walking, and it gets you up and down hills even if you don’t ski with finesse. Pay attention to your posture and movements to improve your performance and get in shape for spring. Here are a few pointers to keep you on track. Lean forward. Cross-country skiing is actually closer to running than walking. This is not the time to stand up straight. Pretend that you’re the Leaning Tower of Pisa. Don’t bend at the hips, and only flex lightly at the knees and ankles. A good kick is “down and back.” For every action there’s an opposite and equal reaction. That means “down and back” will propel you forward. Your arms will swing much as they do when walking. As they swing, your knees will respond by flexing. This bounce will help you maintain your momentum. When you master the kick, you’ll glide with more ease. With little formal training, you can develop sufficient skill to enjoy cross-country. As you enjoy your walk in the woods, you’re also getting in shape. Because many trails are public, you won’t spend an arm and a leg to go skiing. You’ll just get a full-body workout. Curling up with a good book when the snow is falling is one way to beat the cold of winter, but it won’t improve your winter fitness. Curling on ice, however, provides an excellent way to get in shape for spring. Don’t let this unusual sport fool you. It will toughen you up! Despite the physical challenge it provides, injuries are less common in curling than in other winter sports. And the benefits of curling are crazy good! Like other sports played on the ice, curling demands constant motion. You’ll definitely notice the aerobic workout you’re getting whether you are delivering the stone or sweeping. You won’t be moving as fast as a short track racer, but your legs will need the same strength. Curling is played close to the ice, so you can expect sore glutes, quads, and calves if you aren’t in top shape. Talk about winter fitness! Curling delivers! Because so much of curling demands a squatting position, be sure to warm up your muscles before playing. You will also benefit from stretching out at the end of play. Because curling burns a lot of calories, you can offset those holiday pounds you gained earlier in the winter. You’ll be that much further ahead as you get in shape for spring! Whether spring weather means hitting the links, heading to the bike path, or sprucing up the garden, all those winter sports you participated in will help you make the transition more easily. Your instinct might be to hibernate, but maintaining winter fitness is a great way to embrace Michigan winters. For those who can’t embrace outdoor sports in winter, there are plenty of other options to maintain winter fitness: mall walking, dancing, riding a stationary bike, and aquacizing. The point is simple: stay active year-round! We believe in winter fitness at Midland Physical Therapy. If you could use more tips about winter activities or have questions about proper techniques, give us a call at (989) 832-6485 to ask any of our physical therapists, or Contact Us. We’re committed to helping you stay fit and active and injury-free all year.